Get excited for Rafters' birthday. 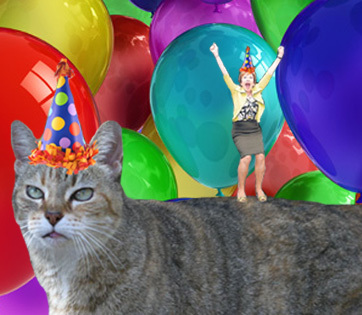 TAMPA, Fla. -- The University of South Florida Botanical Gardens and the College of Arts and Sciences are throwing a birthday party for Rafters, the sassy cat who lives in the gardens. The birthday party will take place on Wednesday, Nov. 14 from 1-3 p.m. in the Botanical Gardens and is an invitation-only event. Come celebrate her birthday with cake and a scavenger hunt to explore the Gardens and a chance to win a Keep Calm and Go Bulls T-shirt. This event is limited to the first 50 people who tweet a picture of themselves with Rafters to @Rafters9 and use the hashtag #RaftersVIP. Admission to the Gardens will be waived for the purpose of taking the picture and to attend the event. The first 50 to tweet a picture will be informed by a direct message through Twitter that they are invited to the party. The USF Botanical Gardens are located at 12210 USF Pine Dr.